Twenty One Pilots are coming to rock the stage LIVE at Frank Erwin Center on Sunday 23rd June 2019! Get ready for a show-stopping, jaw-dropping performance from the out of this world duo as they take to the road on their Banditø Tøur for the summer of 2019! There's no time like the now, to book your tickets and make sure you are part of the roaring crowd! Don't miss out! 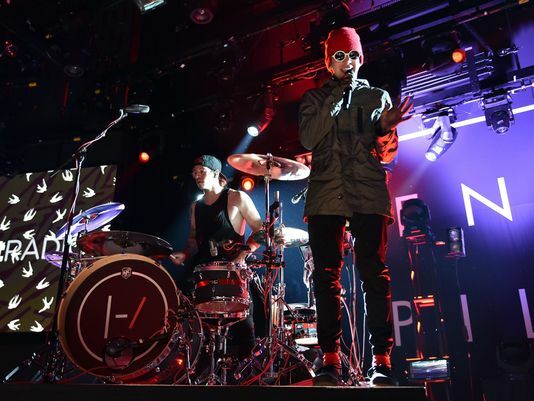 The awesome Alternative Hiphop duo, Twenty One Pilots are taking to the road this summer! The Banditø Tøur supports their groundbreaking release of their fifth studio album "Trench" – released just last year! After releasing their fourth album "Blurryface" and it debuted at No. 1 on the Billboard albums chart and included the hit tracks "Stressed Out" and "LaneBoy." Along with their incredible previous tours such as their 2016 "Emotional Roadshow" dates – Tyler Joseph and Josh Dun AKA Twenty One Pilots are stepping up their game once more to give fans the night of their lives! Since the beginning of their career, Twenty One Pilots have truly always pushed the boundaries, helping to transform their career from the underground music scene to the mainstream. Hailing from Columbus in Ohio, they began their journey in music and together released two self-produced albums. First came their self-titled record in 2009 and then in 2011, their album titled "Regional." With a sign to a label in 2012, Twenty One Pilots were able to keep doing what they love and churned out another record, their debut album at the record label was born, Vessel came out in 2013 and it paved the way for their next release in 2014. The world went crazy for their fourth studio album, Blurryface, released in 2015 included top singles such as "Ride" and "Stressed Out". As well as this the band wrote a song for the film Suicide Squad. Twenty One Pilots single "Heathens" broke through and pushed their career even further as they became the first alternative artist to gain two concurrent top ten singles in the US! Come and support them as they now celebrate their latest release and once again shake the world to it's core as they perform LIVE right before your eyes!